Following a rigorous design and evaluation programme, MICAM HORIZON composite based wall panelling system has been selected for use within Heathrow Terminal 2A, a £2.5 billion investment which is currently the UK’s largest privately funded construction project. 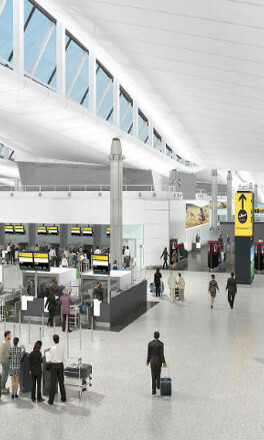 Completion of the project, which replaces the former Terminal 2 and the Queens Building dating from the 1950s, is scheduled for the first half of 2014. The new terminal will have a capacity to handle 20 million passengers annually and has been designed to reduce CO2 emissions by 40%. As Heathrow is a live airport, the construction of materials off-site has been a key deliverable in order to maximise the project’s efficiency. The composite panels are manufactured from MICAM’s high performance phenolic prepregs and are fully assembled at MICAM’s manufacturing facilities in Cork, Ireland, before being shipped to the new terminal ready for installation. MICAM will be presenting HORIZON together with their extensive prepreg and composite laminate range at JEC Europe.